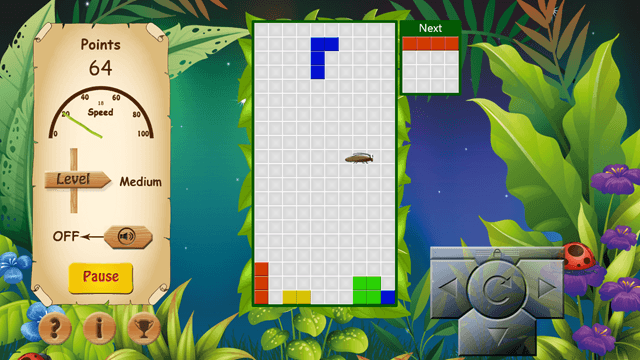 BugTris is an interesting take on Tetris for Windows 8 and Windows 8.1 devices. If you have ever played the classic block building and busting game before, you know that you have to rotate and match the blocks in a way that they form a complete line, and that line of blocks then disappears. In BugTris, you have to do the same thing, except in this game, there are some bugs (by bugs, I don’t mean glitches, I mean bugs like worms, caterpillars, cockroaches etc.) that you can crush while forming a line to gain some extra bonus points! These bugs move across the screen and you can slam the incoming block on them to crush them by increasing the block speed (down arrow button). Different bugs have different movement speeds, and they give you different bonus points. Crushing caterpillars will give you an extra 30 points per caterpillar, and cockroaches will give you an additional 60, regardless of whether you have made a complete line or not. Let’s read more about this interesting game now. Left/Right Arrow buttons: Move the incoming block towards left or right respectively. Up Arrow: Rotate the incoming block so that it fits the line of blocks at the bottom. Down Arrow: Speed up the descent speed of the incoming block. Useful for crushing bugs that move about the screen. You can also use the on screen controls on touch devices which are present at the bottom right corner of the screen. When you launch BugTris on your Windows 8 or Windows 8.1 device, you will be presented with a screen which looks like the screen below. 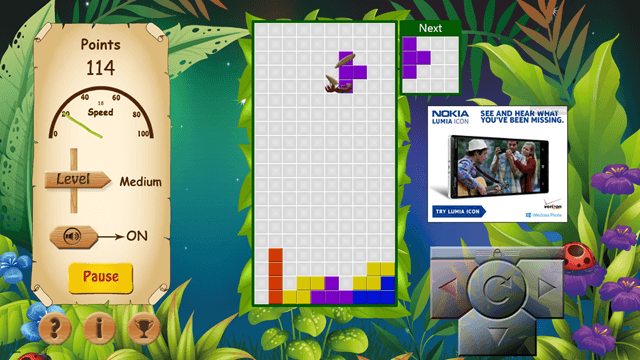 As can be seen in the above screenshot, you will be able to see the gameplay zone at the centre, the option to start the game at the bottom left (Start button) and the onscreen controls at the bottom right. Once the game has started, you will be presented with the incoming blocks. The next block after the current incoming block will be shown inside the NEXT box at the top right corner right next to the gameplay zone. As you can see above, I have started my game. You can also see the cockroach in the above screen. You can ram your block on it to get some extra points! To ram the block on the bug, the down arrow button comes in handy. At the left side of the screen, you can also see the speedometer which shows the speed of the next incoming block. This increases manifold as you progress through the game. You can also see the points and the difficulty level that I’m playing at. You can toggle the difficulty level and the sound using the onscreen controls. Although the difficulty level can only be changed before starting a game, the sound can be turned on or off during the gameplay as well. You can see above that I have crushed a cockroach in the above screen, and I got 60 points awarded for the same! Overall, the game is amazing in the sense that it is incredibly lightweight, and insanely addictive at the same time. You can keep playing it for hours without letting go, it’s just that gripping! I don’t really have anything to hate about this game (except maybe the ads!). The pure design philosophy of this game is brilliant – from being a take at the classic tetris with a new flavor of throwing in bugs that can be crushed, the game has totally pleased me. It runs well on almost any and every Windows 8 and Windows 8.1 device, regardless of the RAM and other specs of the said device. You should definitely try it out!